Did you know? In 2016, Norwex was ranked one of the Top 5 Direct Sales companies globally. In Canada, it was ranked #2 and is one of the fastest growing, direct-sales companies. I’m not surprised that it would be Top 5, as I have found Norwex is the most ethical, diverse, innovative, non-pushy, recession-proof, environmentally-friendly, direct sales company out there. Norwex makes a Global Difference – Products are responsibly source, produced and distributed. Norwex Products are sourced from 12 different countries and all their factories are State-of-the-Art… creating Safe, Good Jobs across the world. Your Norwex Business is willable. Fantastic Home-based business that provides Freedom and Flexibility. You choose how much you work and when… casual, part-time or big-time. Keep reading to see what incentives are available for New Norwex Consultants who sign up in September! Each month there is a different incentive… they always give you a taste of what it is like to work with Norwex… a generous, forward-thinking, world-changing company. When you join Norwex, the first thing you need is product to demonstrate at your future parties… very near-future parties!!! That is what the FREE Standard Party Starter Kit is all about! It is stocked with many of the favourite, top-sellers and will be a good start to your collection. This month, there are 2 BONUS products in the Starter Kit (worth $68)… A beautiful Graphite Kitchen Towel and a Chenille Dry Mop Pad. Direct Sales is about educating people why they should buy a product and then letting people ‘try’ before they ‘buy’. For example, disposable plastic straws are a problem for our environment, as you have probably heard. They are used for a one drink and then tossed… often finding themselves in the waterways and then hurting not only our environment, but animals as well. It is a big problem. Read, “How do Plastic Straw Bans Work?” by the National Geographic as they weigh in on the issue of plastic straws, and the bigger issue that plastic creates. This is a quick example that reveals how as Norwex Independent Consultants, we can educate our customers about environment issues and how choosing Norwex products, like, Norwex Stainless Steel Straws, will change the world. People often need to know the ‘WHY‘ before they will change. What is the Free Standard Party Starter Kit? The Standard Kit is always FREE! It does have a $2000 sales requirement, due within the first 90 days of business. The kit is worth over $300 (+ $68 Bonus Products in September) in top-selling products. If you are unable to sell the sales requirement, it will only cost you $200. Think of this as your first business goal! As a Norwex Independent Sales Consultant you will receive a 35% commission starting on your very first sale. That means, when you sell $2000, you will earn $700 commission + get your KIT for FREE! FYI: An average party sells $500 in product. So you will need to plan to host one or two launch parties, plus two additional parties. Launch parties are the ones that you host and invite all your family and friends, reap 35% commission, earn the Host Rewards, work toward FreshSTART rewards (more info below) and work towards your FREE Standard Party Starter Kit!!! These launch parties are essential because it is where you ask a friend or your sister to host a party… and from there you will start meeting your future costumers. When you sign up, you have the opportunity to take advantage of the FreshSTART program. What is it? It is Norwex’s program that help new consultants get their business skills moving and reward them with FREE product for being successful. It is the best deal going… and it is only available for my new consultants. 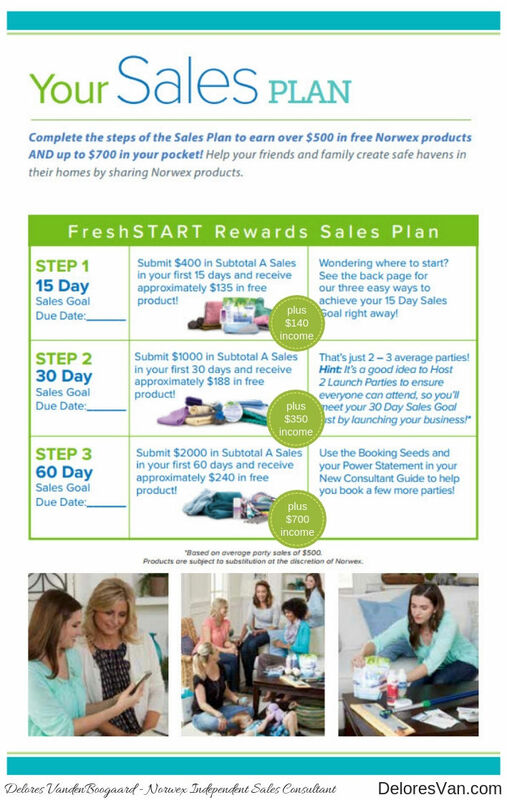 FYI: When you complete the FreshSTART program you will have earned $700 income and earned $563 Free Product! What I know for sure is that the more products you personally use in your home… the more products you will sell at your parties! The more products you try, the more you will be excited about them and will have more experiences to share with your customers. Norwex products solve problems and when you have fixed problems in your home with Norwex, you will hardly be able to contain your excitement to educate others. This excitement turns into sales! The Kit Builders are available for new consultants who want to get their hands on a lot of product. There are 3 kits, but my favourite is the Gold Package. Seriously, it is golden! Why? First, it is stocked with great product. Second, you receive it at 45% off retail. Third, when you buy it you, earn your Step 1 FreshSTART Sales Goal (so you get an addition $135 in FREE Product). It is a ‘shiny‘ way to start your business when you Join Norwex. This is part of the FreshSTART program, but it about growing your business from the start by recruiting others. You might be thinking? 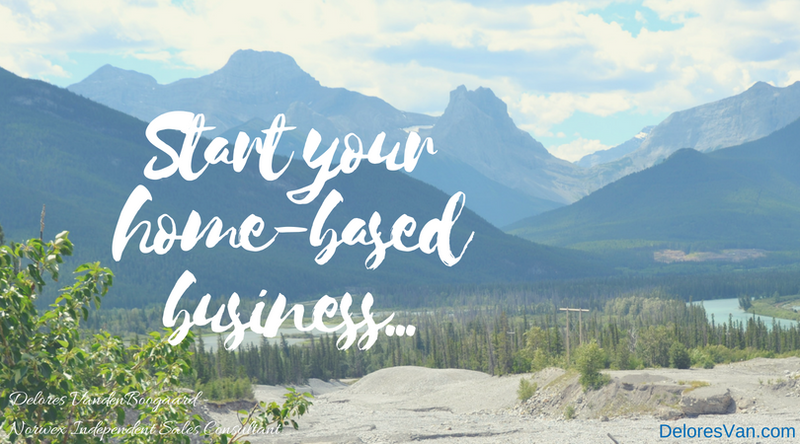 “How can I grow my business, when I am just starting out?” I say, this is the best time. Who would you like to work with? Who loves Norwex as much as you? Who needs some extra income? I’ve seen that people who team up and start the businesses together do better than those who don’t. They have someone to learn with, someone to bounce ideas off, someone to encourage and someone to celebrate successes with. Building a team by recruiting other like-minded individuals is how Norwex grows and fulfills it’s mission. Join Norwex in September and be part of a fast-growing, direct-sales company whose mission is to change the world. 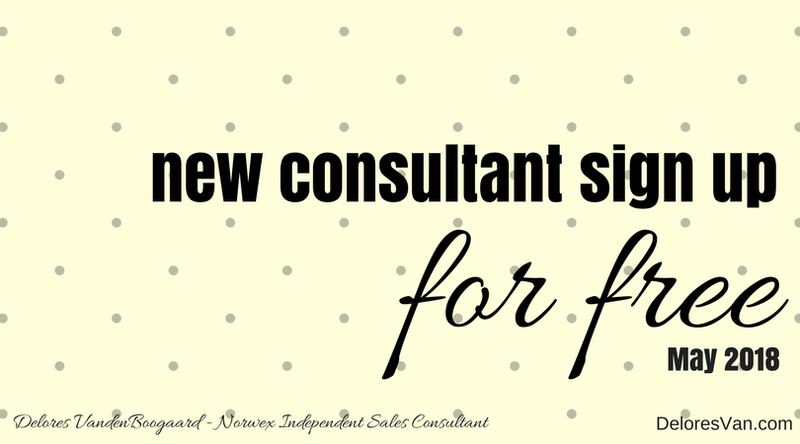 Wondering if Becoming a Norwex Consultant is right for you? Belong to a group of like-minded people who agree with Norwex’s purpose is “The idea that working together, with integrity, trust and respect as our Core Values and improving quality of life by radically reducing chemicals in our homes as our Mission, we can improve the world around us”. Believe that we can make a difference in the world, one consultant at a time, in one home at a time. Believe in the Norwex product! It is a superior all-natural, environmentally-friendly line of products that make cleaning our homes safer, faster and less expensive. Build your business! Don’t keep this to yourself, it is such an amazing opportunity that we need to share it with other like-minded people. Norwex is a direct-sales business opportunity that provides products/solutions that are important to society. Our environment and our health are compromised by the chemicals we use in our day-to-day lives. Everyone cleans their homes with something!!! Norwex offers safe, easy-to-use, non-toxic products… and offers an amazing business opportunity to those who want to share these products. Sound good? 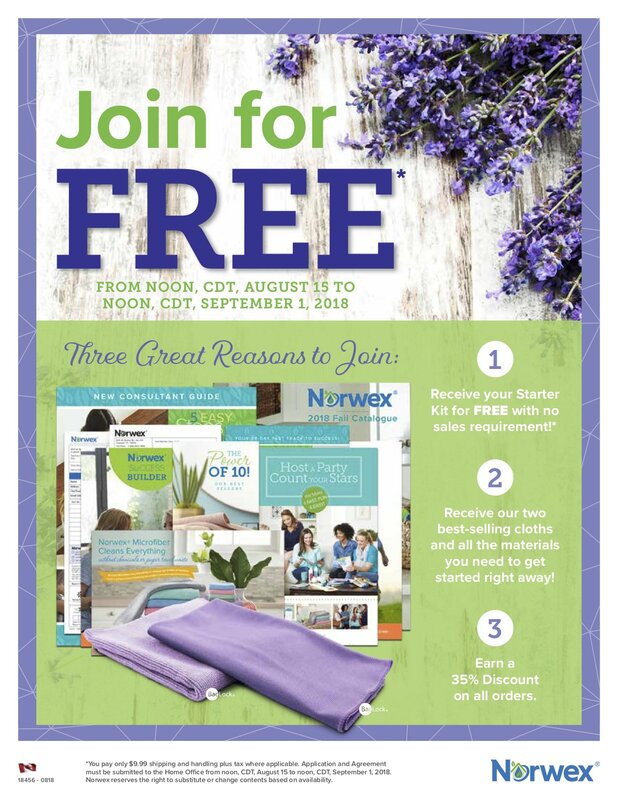 Keep reading to see how to sign up with Norwex and start your New Home-Based Norwex Business. 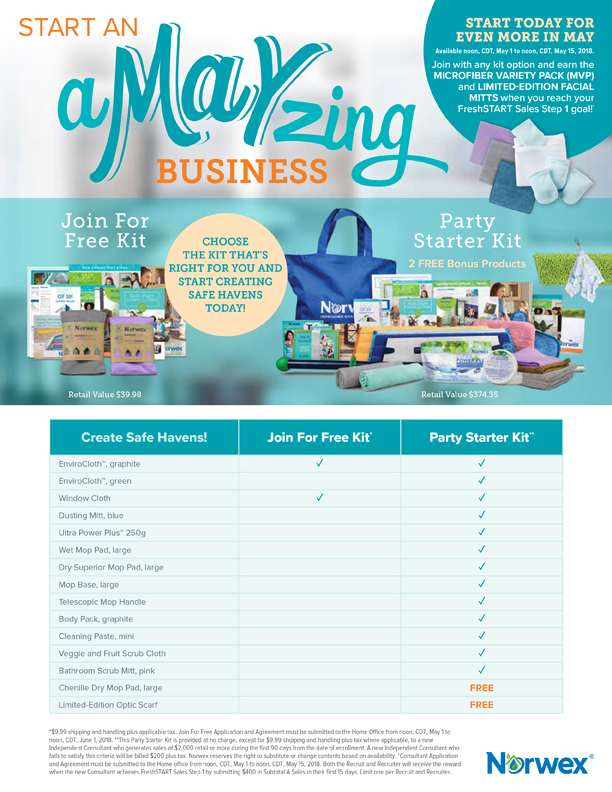 After signing up (technically that would be step 1) you will need a variety of Norwex products and business supplies to get you ready for your launch party. Norwex is a direct-sales business, meaning, through creating connection and relationship with people and educating them about what Norwex offers, the product will sell itself. The more product you have, the better. Nothing sells more Norwex Mop Systems than being able to show your customers how easy, quick and effective the system works to remove up to 99% of bacteria from the floor with just WATER. The Mop System, if you were wondering, is one of the amazing products included in the Standard Kit. The Standard Kit is always FREE! That said, it does require you sign a contract to sell $2000 in your first 90 days of business. The kit has over $300 dollars worth of top-selling products and if your business has a slow start, it will only cost you $200. Be encouraged, think of this as your first business goal! You will receive a 35% commission starting from your first sale. When you sell $2000, you will earn $700 commission! An average party sells $500 in product. So you will need to gear up for one of two launch parties and two additional parties. Launch parties are the ones that you host and invite all your family and friends, reap 35% commission, earn the Host Rewards, work toward FreshSTART rewards (more info below) and work towards your FREE Standard Party Starter Kit!!! From your launch parties, ask a friend or your sister to host a party… once the ball gets rolling, you will be in BUSINESS! 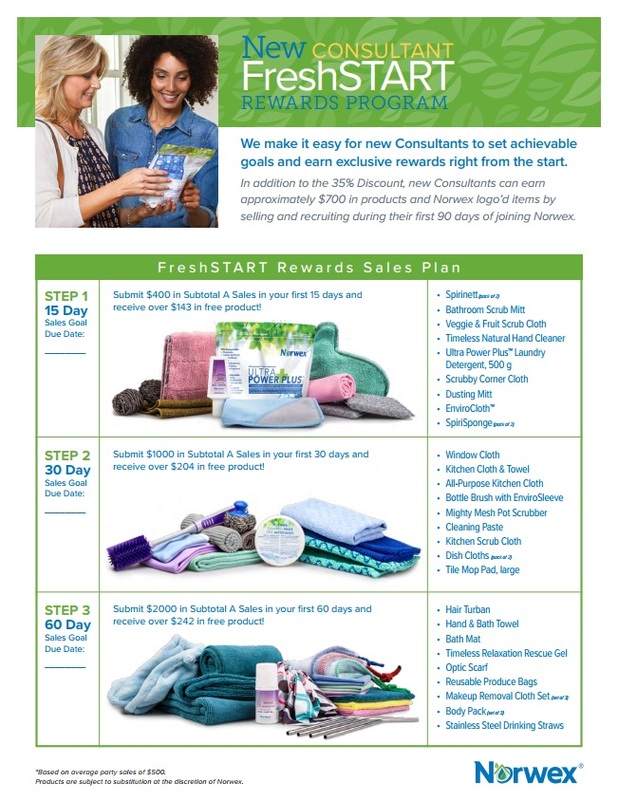 Norwex offers New Norwex Independent Sales Consultants an awesome reward program, that helps them get their business to a great start… right from the beginning. It is for those who are thinking, “I’m in! I want my business to be a success and take advantage of all that is available for me!” The FreshSTART program will help you set reasonable, attainable sales goals and then reward you for reaching each goal. Norwex has thought of everything! Only new Norwex Independent Sales Consultants are given the opportunity to build your Standard Kit… to get more demonstration products, at a great price, with great rewards. Silver Package – You will receive this kit for 43% off retail price. The kit contains various top-selling products, plus $27 in Business Supplies. It allows you to keep your Norwex account active (minimum sales requirement is $250 every 6 months) and gets you well prepared for your launch parties or even stock your own home. Gold Package – My personal favourite!!! You will receive this kit for 45% off retail price. It is stocked with more amazing products as well as $44 in business supplies. PLUS, with this purchase… you will earn your 1st FreshSTART sales reward ($135 in FREE PRODUCT)… so you will be double-prepared for your launch parties. Platinum Package – A serious sampling of the Norwex collection that you receive for 45% off retail price! It will give you EVERYTHING you need to successfully launch your business, including $44 in business supplies. It has enough so you can use some in your home as well as build your starter kit. One more thing… As you purchase products for your kit, remember they are part of your ‘business expenses’ and as such can be claimed on your income tax! Did you know? Stats show that a Norwex Independent Sales Consultant who signs up other consultants early in their business, do better in direct sales than those who don’t. Why? It is because you get to do and learn the business together. When you invite others to sign up. you are choosing your co-workers and who to grow with…who doesn’t want to do that?! I know this idea of growing your team may feel a little TOO soon but think about this… Do you know anyone who loves the product like you? Any who believes in Norwex products and their mission? Anyone who would like to earn more income? Let these people be the first on your list to invite… then get rewarded with Norwex’s FreshSTART Business Builder Bonus. What do you dream about? How do you see yourself in 5 years? 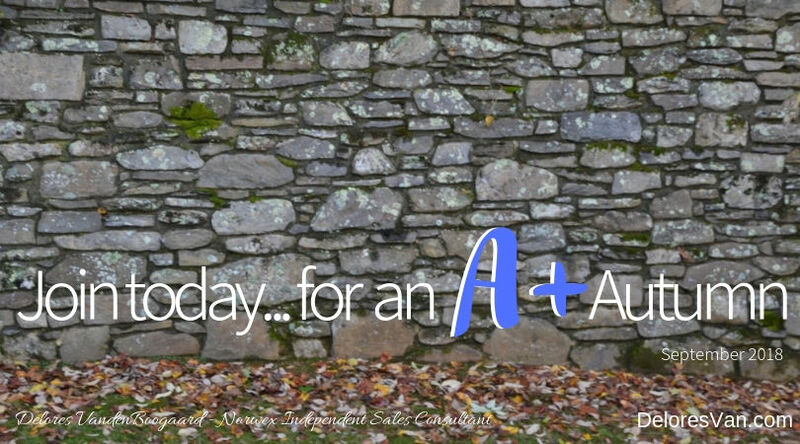 Take John Maxwell’s advise and focus on what you are doing today. Signing Up with Norwex might be your first step. Share your 5-year dream in the comments. Is Norwex a good fit for you? I love finding out why people want to become a Norwex Independent Sales Consultant. I became a Consultant because I wanted to remove the chemicals from my home, create a safe place for my girls to grow up, I believed in the product, had a desire to help with my family’s financial needs and I wanted freedom to choose when I worked. What are you looking for in a career? Globally, the responses are similar. #1. People consider INCOME when they choose their career! #2. People want a career with FLEXIBILITY! Amazingly, in 2017, flexibility almost tied for the most important thing people look for when choosing a career. Norwex provides both these things people want in their career by offering to make a fantastic living and the flexibility to work when (and how hard) you like. As the old saying goes, “work to live, not live to work,” …people want to enjoy their life! Norwex is the fastest growing direct-sales company in the world and there is so much potential for those who want it. How do you sign up for Norwex? 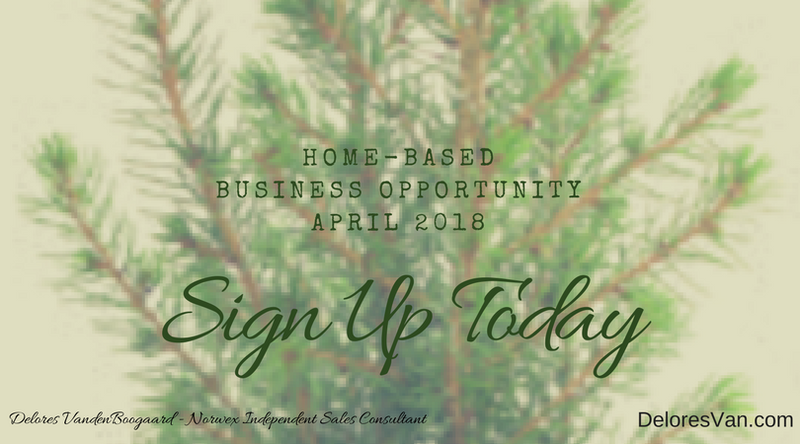 Norwex makes signing up and starting your new home-based business simple and effective to get your business started on the right foot and succeed. Let me go through the steps so you know what to look forward to! The Kit is FREE. You will be required to sign a contract stating you will sell $2000 in product within the first 90 days of business. If your business has a slow start, the Kit will cost you $200. The Kit has over $300 worth of product! It includes amazing products like Ultra Power Plus Laundry Detergent, Dusting Mitt and Cleaning Paste… not to mention the Superior Mop System!!! Host one or two launch parties at your house (invite everyone you know… local and distant relatives). Ask 2 of your friends/family members to host a party. Remember you receive your 35% commission starting with your first sale… so when you sell your first $2000, you not only receive the Standard Party Starter Kit for FREE, you also earn $700 commission (and when you host your launch parties you also receive the Host Rewards). What a way to start your business! Ready to join Norwex, jump in and get going? I totally encourage you to take advantage of Norwex’s FreshSTART Program. It will help you get your business moving, set goals, be rewarded with FREE products and celebrate your earliest successes. 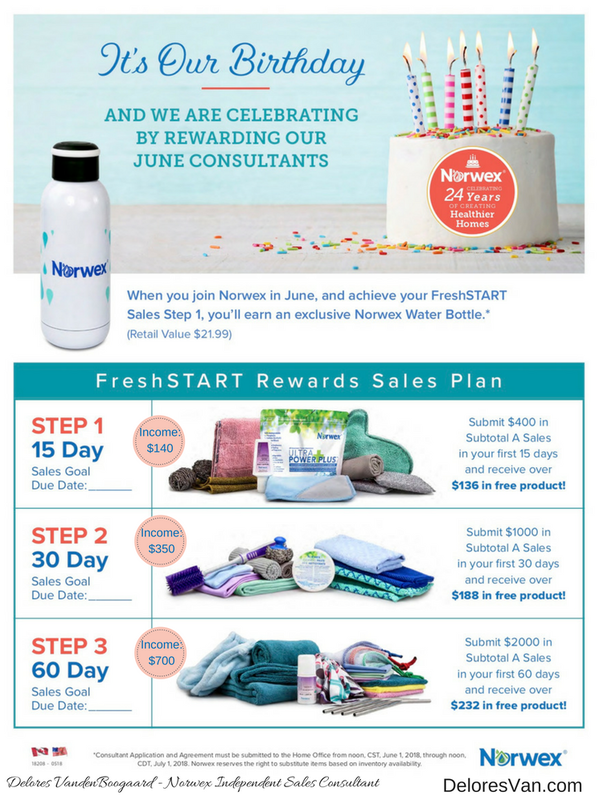 It is Norwex’s 24th Year of Business and to celebrate they are giving new consultants who achieve STEP 1 in the program an exclusive Norwex Water Bottle. You will love having this simple conversation starter to help you spread the word about your new business. I take my Norwex Water Bottle everywhere and you would be surprised how many times people ask me if I am a Norwex Consultant. The FreshSTART program rewards are in addition to your 35% commission, host rewards for your launch party, and Standard Party Starter Kit. These Kit Builders are a great way stock your demonstration with the great product and they are only available for new consultants! They bundle up great products and then give you 8, 10 or 12 % plus your 35% consultant discount, to help you get started. You receive $516.79 worth of product for $302.32 and $44 in FREE Business Supplies. That’s 45% off Retail Price. You earn Step 1 in the FreshSTART Program. That’s $135 in FREE Product. You protect your consultant status for 6 months. As a consultant, you are required to sell $250 every 6 months to keep your account active. See if the Gold Package is your favourite? Building your business is probably not on your radar right now. You are probably thinking… I haven’t even started! I get that… but let me just say that research shows that those who sign up others as soon as possible do better in the direct-sales industry. Why? When you do this business together, you learn, earn, discover and grow together. Nothing is better than sharing the excitement of success. Think for a minute. Do you know anyone who loves Norwex product? Believes in Norwex’s Mission? Could use some extra income? Someone you would like to work with? This is the person/people you could offer the opportunity become a Norwex consultant with you. 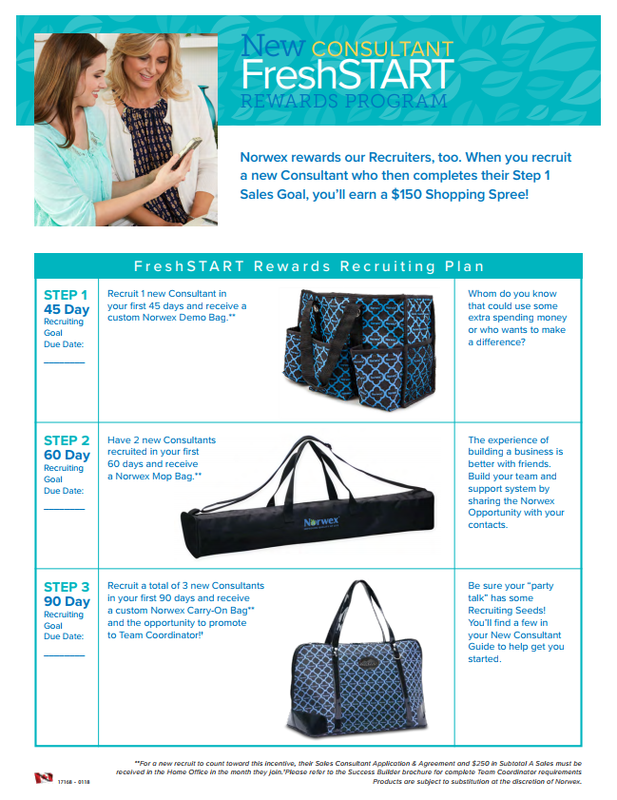 Norwex has rewards for new consultants who take the risk to recruit a friend to join Norwex with them. Take a peek at the rewards. Do 4 or 5 parties. Earn your Standard Party Starter Kit for FREE. Reach all the FreshSTART Steps and earn $556 FREE Product. Just give it a test drive. Take advantage of all the start-up incentives and then decide if Norwex is for you. Bet you love it! 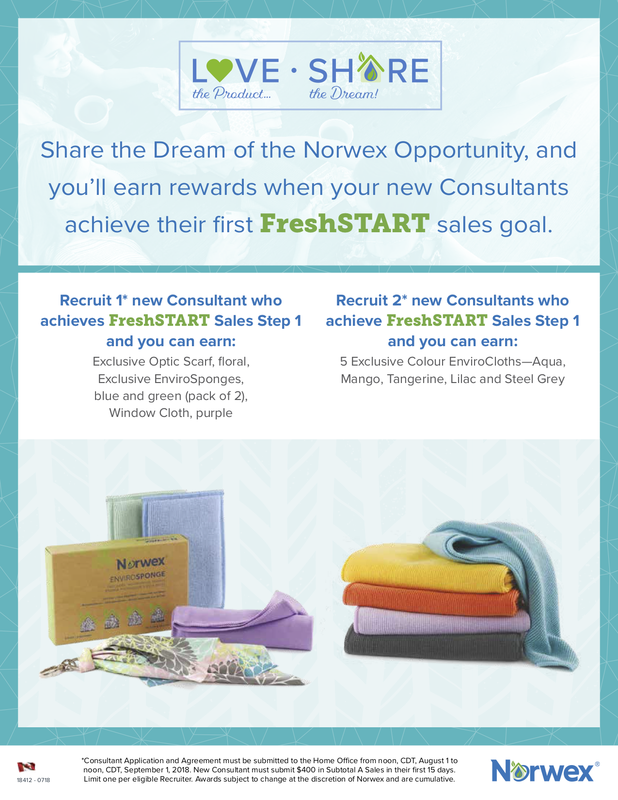 During the month of May, Norwex is offering FREE sign up for New Consultants. THAT IS aMAYzing!!! This option is perfect for the consultant who plans to work part time or simply to buy the product for personal use. There is no sales requirement, but you do still receive a few Free Cloths and your discount. You may be surprised, but Norwex has a large number of casual consultants… with having Norwex’s best selling cloths in your possession and some business supplies, you have all you need to start. 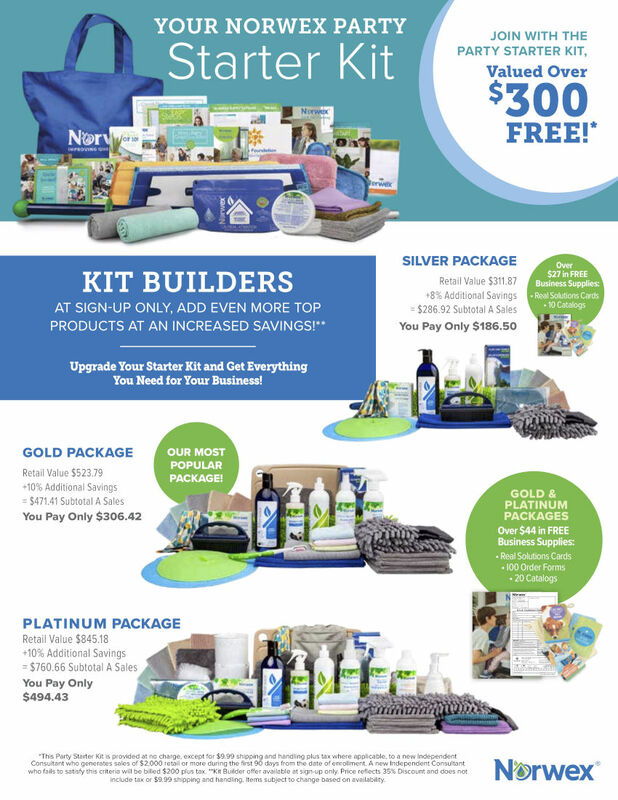 FREE Sign Up, FREE Sign Up Kit with EnviroCloth, Window Cloth and Essential Start up Business Supplies, 35% Discount on all Personal Orders, BONUS Additional FreshSTART Rewards (more info below). This option is perfect for someone looking to start their business with enough product and supplies to confidently host a launch party and get their business going. The Party Starter Kit is provided at no cost (except $9.99 Shipping and Handling) when you generate at least $2000 in Retail Sales during the first 90 days of your business. I like to think of it as your first sales business goal. 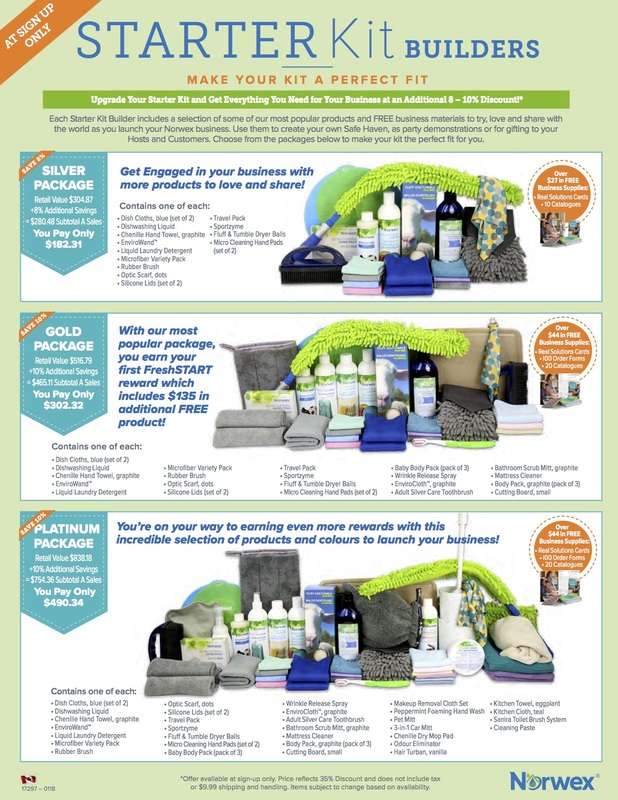 FREE Sign Up, FREE Party Starter Kit ($300+ variety of products), Essential Start up Business Supplies, 35% Discount on all Personal Orders, BONUS Additional FREE Chenille Mop Pad and Limited Edition Optic Scarf, BONUS Additional FreshSTART Rewards (more info below). The Party Starter Kit is a great sign up option. The Kit supplies you with many of the top-selling products, like a Dusting Mitt, Ultra Power Plus Laundry Detergent, Bathroom Scrub Mitt and to top it off… a Large Superior Mop System. It also comes with a generous amount of business supplies. There are 2 BONUS products this month… the Large Chenille Dry Mop (will work with your superior mop system) and the Limited-Edition Optic Scarf. You will be ready to roll. The more products you have to demonstrate the easier it is to sell the product, because the product is amazing and sells itself. Everyone needs to clean… Norwex products are innovative, eco-friendly, time-saving, money-saving and health conscious. People love them. To earn this kit for FREE you will need to plan on having approximately 4 parties in your first 90 days of business… the average party sells $500. Plan to host 2 Launch Parties. This way you can invite all your friends and family. It is a great way to introduce your new business, plus you get rewarded 3 ways… as the Consultant (35% commission), as the Host (Host Rewards), and earn your sales to get your Party Starter Kit for FREE. I love this program. It is really geared towards making new consultants ‘business-minded’ and rewarding them for their successes. 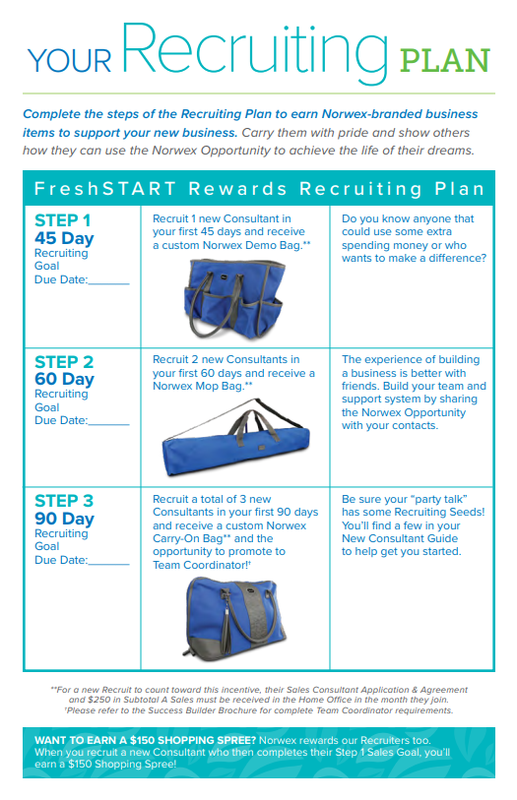 The FreshSTART Program sets reasonable sales and recruiting goals, then rewards consultants with FREE products and business accessories to help them succeed. Until May 15, 2018, whether you choose the ‘Join for FREE Kit’ or ‘Party Starter Kit’, you will receive a BONUS Microfiber Variety Pack (MVP Pack) and Limited Edition Facial Mitts when you complete the FreshSTART Sales Step 1. There is so much to sign up for this month!!! Let me tell you about just one more opportunity that’s available for you as a New Norwex Consultant. The best way to sell Norwex is to let customers try it out before they buy. A simple demonstration of how easy it is to clean your glasses or your cell phone screen with an Optic Scarf will sell more than just describing how to use one. People love to touch the products and hear testimonials from their friends about how great the products are. Norwex offers 3 different Start Kit Builders that, as the title suggests, builds your Starter Kit so that you have LOTS of product to demonstrate. The GOLD PACKAGE is my favourite Starter Kit Builder. It has a great variety of best-selling produces as well as some Real Solution Cards, 100 Order Forms and 20 Catalogues. It is valued at $516.79 retail, but you pay only $279.07. And it gets better, when you purchase the Gold Package, you automatically earn your first FreshSTART Sales Reward and receive $135 in FREE Product. 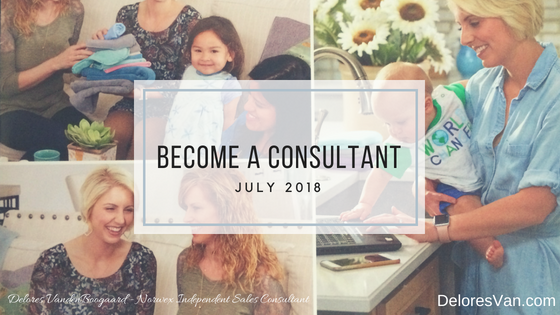 It will get you on your way… and give you a taste of how generous Norwex is to their consultants and how they want to help them succeed. This is such a great time to join Norwex. I have been an Independent Sales Consultant since 2006 and have been honoured to do my job since day one. I like to say, “You are in business for yourself, but not by yourself.” Join my team – The Solution Team – and be apart of a successful, helpful, diverse, educated, experienced group of consultants. have flexibility in the amount you work? offer some of the most generous host rewards in the direct selling industry to your customers? be your own boss, but have lots of support? earn 35% commission, starting on your first sale? learn how to develop a team of Norwex consultants? promote a healthier lifestyle and a greener planet for future generations? have the opportunity take advantive of Norwex sales incentive programs and team building promotions for the chance to win gifts and awards? earn 35% discount on your personal product? Sound like a big promise? 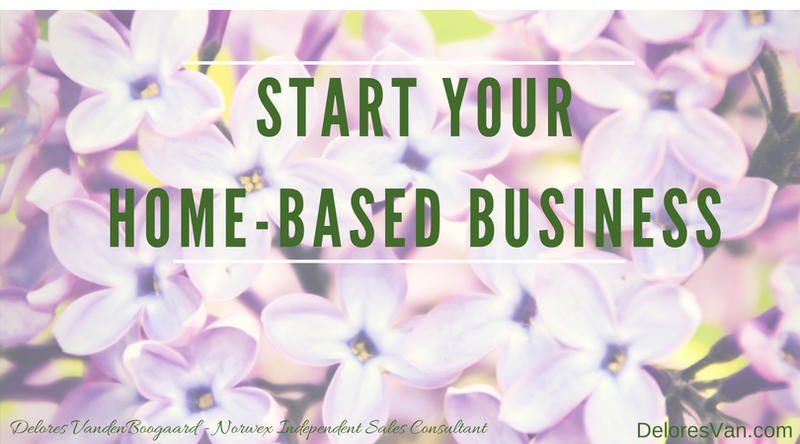 It is exactly what starting your home-based Norwex business and being an Independent Norwex Sales Consultant is all about. Norwex is a direct-sales company that is committed to “MAKING A GLOBAL IMPACT…one person at a time.” It offers environmentally-friendly, non-toxic, all-natural alternatives to clean your home and care for your body. The EnviroCloth was the first Norwex product. It is made of superior microfiber that is 1/200th the width of a human hair, has exclusive Baclock™ technology that works to self-purify the cloth and only requires WATER to clean the hard surfaces in your home! Norwex has lots of innovative products like this to make your homes chemical-free and make our world a better place. As a consultant, it is your job to educate other about the Norwex alternative products and make a difference in world. 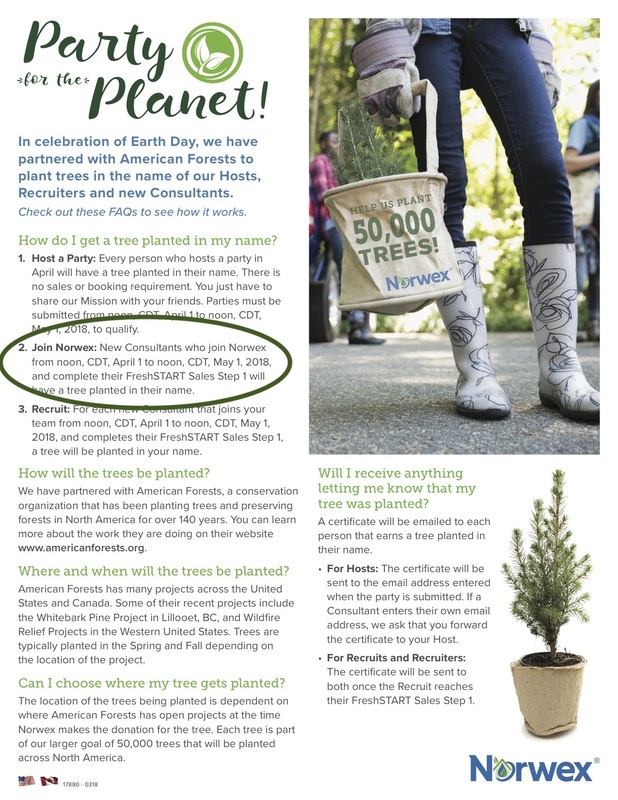 When you join Norwex during April and reach your FreshSTART Sales Step 1 (more info below), Norwex will give you an Exclusive Norwex-Branded Water Bottle and then plant a tree in your name. What a great way to start your Norwex legacy and join Norwex’s celebration of Earth Day! As a new consultant, you will need product to demonstrate to your customers. 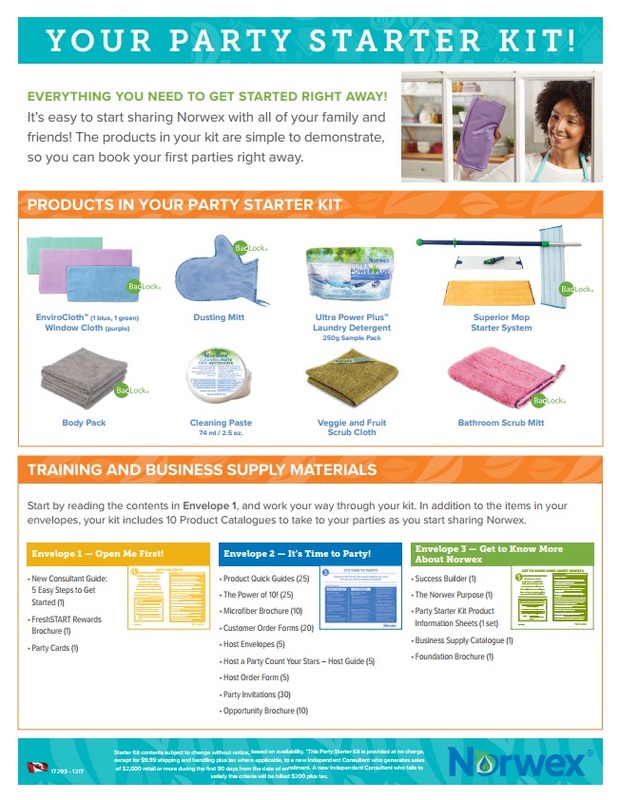 The Party Starter Kit consists of top-selling Norwex favourites to get your business started. 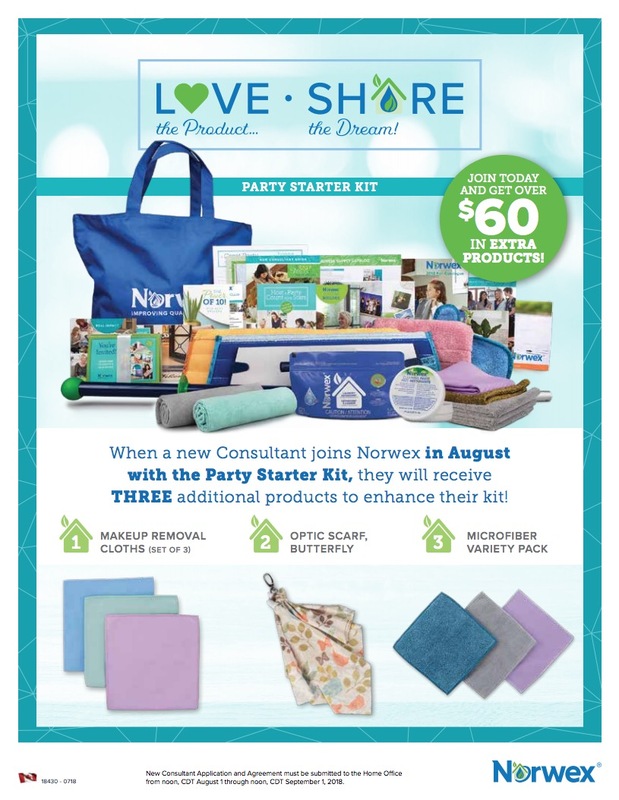 Norwex gives the Party Starter Kit for FREE to new consultants who sell $2000 in their first 90 days of business. This is easy to do in three months, by simply doing 4 demos! Plus, you’ll earn 35% commission on your sales immediately… earning you $700 cash!! The kit is valued at over $300 so for consultants whose business has a slow start, and you miss the $2000 sales requirements the fee to purchase it is only $200 (it’s all in the contract). Consultants can earn $200 by selling only $572 worth of product!! The average party sells $500 in product, so that means you only need 4 parties in your first 90 days to receive the Party Starter Kit for FREE. Think you need more product? Check out the Build your Starter Kits. There are 3 options to get more product and the more product you let your customer try out the better (more info below on Starter Kit Builders). As a Norwex Independent Sales Consultant, you will earn 35% commission on your very first sale! That means, you will earn $700 in commission when you sell your first $2000 in product. Norwex ships orders straight to each customer’s door. So invite all your friends and family both near and far to your Norwex Launch Parties. Make the most of social media by creating an event on Facebook, or simply text or email the Norwex link to people in your contact list. You can even hand out catalogs for your loved ones to browse through. My favourite Kit Builder is the Gold Package, because it gives my new consultants the best value for their money and the most benefits for their business. It contains $516.79 worth of product… but you pay only $302.32 (with 35% discount, PLUS 10% off). It features great products like: Liquid Laundry Detergent, Optic Scarf, Micro Cleaning Hand Pads, EnviroCloth, Adult Silver Care Toothbrush, Mattress Cleaner and more. Another great benefit by purchasing the Gold Package, you will earn your first FreshSTART Sales Step. This month that includes: $135 FREE product, Exclusive Norwex-Branded Water Bottle and have a tree planted in your name. I love this kit builder! Now that you have products to demonstrate, the next step is to book a launch party or two. You host the party in your home and invite everyone you know! Your mom, sisters, friends and all their friends. The sales from your launch party count towards your first $2000 sales goal, you will earn Host Rewards, you will earn more party bookings, plus you will earn your 35% commission. So, pick a date, send out the invites, believe in a GREAT START to your business. Be creative… people love getting together for a fun time, with food, beverages and even few free give aways. You will be changing the world… starting with your launch party. 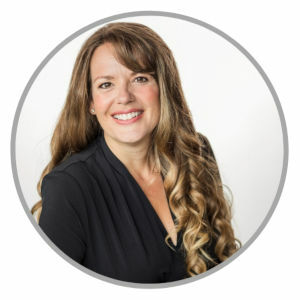 The FreshSTART Program is an amazing program to help you learn how to set achievable goals for your home-based business… right from the start. Goals are an essential part of growing a successful business… they keep you focused, on track and help you gauge the progress you have made. With each step you will be rewarded with FREE Norwex product which will help you build a diverse demonstration kit (or give you some products to use in your home). 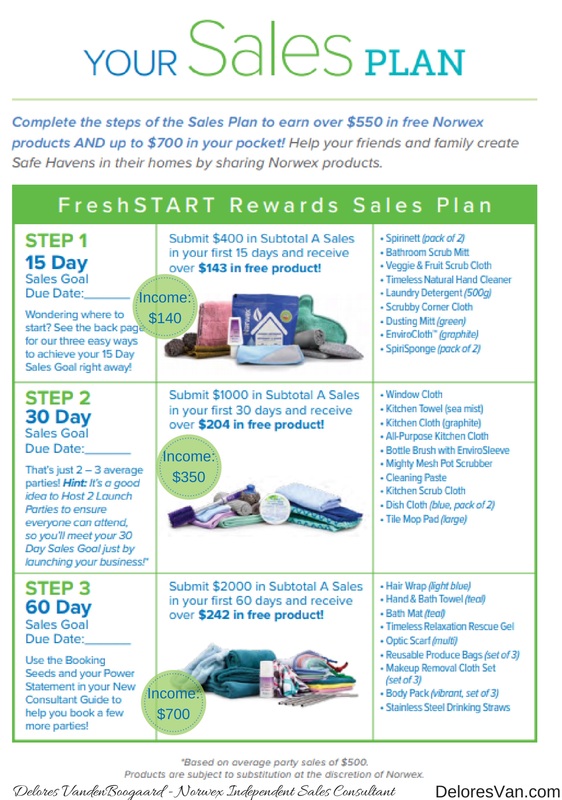 Norwex’s FreshSTART program can be thought of as a “90-day, clean, green journey”… to get you started. 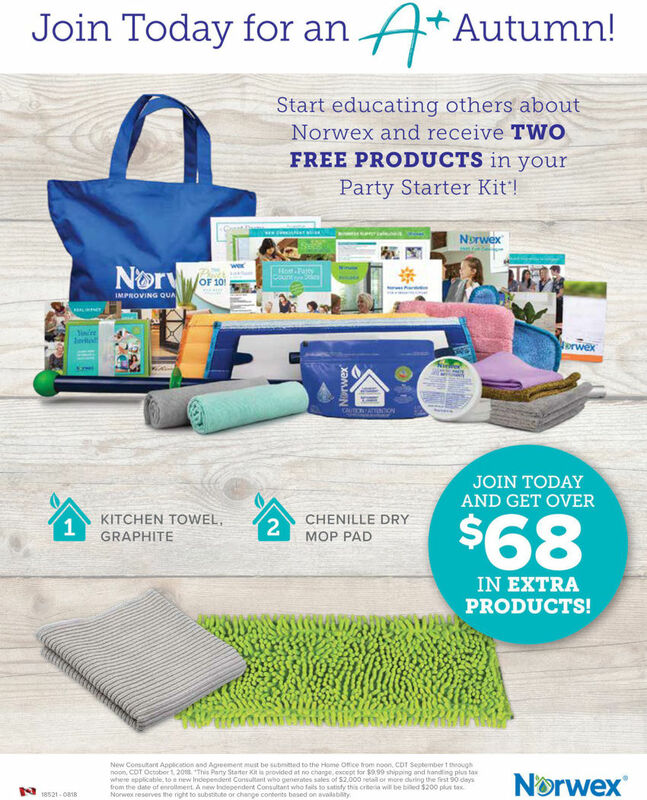 Join Norwex and help celebrate Earth Day this year! 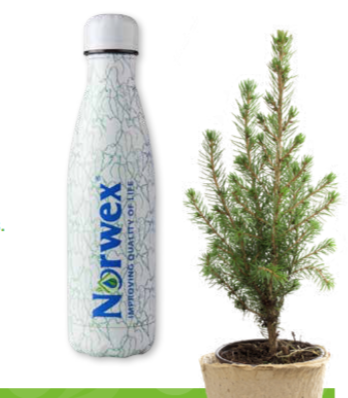 As I mentioned, when you reach your first FreshSTART Sales step you will receive an Exclusive Norwex-Branded Water Bottle and have a tree planted in your name… in addition to receiving $135 in FREE product. What a way a symbolic way to start your new business. I encourage you to frame your Tree Certificate and place it in your office as a reminder of where your business started!